Rated 4.0 out of 5.0 based on 140 surveys. 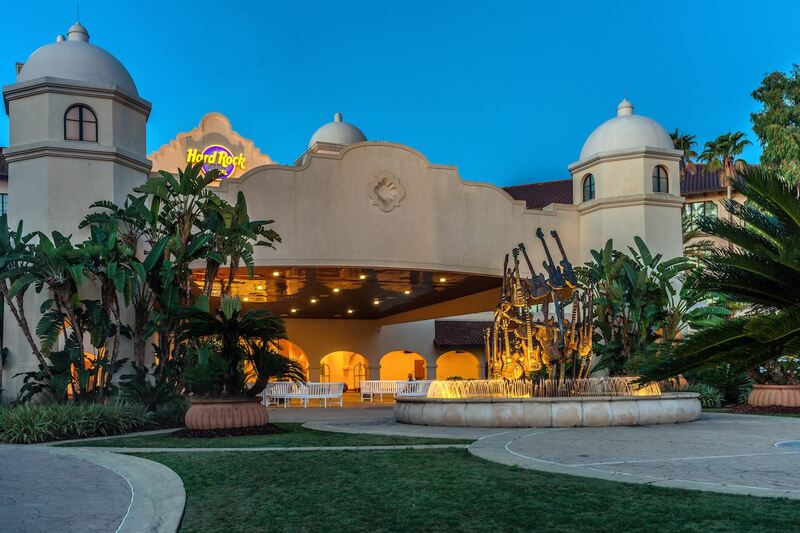 For younger adults and families with older kids, the Hard Rock Hotel is the hippest place to lay your head. Opened in 2001, the Hard Rock Hotel is both Universal Orlando’s least expansive (but second most expensive) on-site resort and the closest resort to Universal’s theme parks. The exterior has a California Mission theme, with white stucco walls, arched entryways, and rust-colored roof tiles. Inside, the lobby is a tribute to rock-and-roll style, all marble, chrome, and stage lighting. The lobby’s walls are decorated with enough concert posters, costumes, and musical instruments to start another wing of Cleveland’s Rock and Roll Hall of Fame; ask the front desk for information about a self-guided memorabilia tour. The Hard Rock's 8 floors hold 650 rooms and 29 suites, with the rooms categorized into standard, deluxe and club-level tiers. Standard rooms are 375 square feet, slightly larger than rooms at Disney's moderate resorts and a bit smaller than most Disney deluxe rooms. The Hard Rock Hotel completed a top-to-bottom "remastering" of their rooms in early 2015, giving the formerly masculine decor a major makeover with light grey walls and linens, pastel furniture, and colorful retro-inspired accents, like throw pillows crocheted with phrases like "Quiet Please" and "Be Nice." To be frank, the style looks more bubblegum pop than hard rock, but the brighter look is a bit more soothing after you stumble back from a fatiguing day in the parks. Standard rooms are furnished in with two queen beds with smooth, plush and comfortable linens and more pillows than you'll know what to do with. Rooms also include a flat screen LCD television, refrigerator, coffee machine, and an alarm clock with a 30-pin iPhone docking port. A six-drawer dresser and separate closet with sliding doors ensures enough there's storage space. In addition, most rooms have a reading chair and a small desk with two chairs. An optional roll-away bed, available at an extra charge, allows the standard rooms to sleep up to 5 people. Each room's dressing area features a sink and hairdryer. A separate door leads to the bathroom, which includes a shower, toilet and small sink. The bathroom is probably large enough for most adults to get ready in the morning while another person gets ready in the dressing area. Water pressure was above average in the rooms we tested, and the toiletries were good. Guests staying in standard rooms can choose from one of three views: standard, which can include anything from walkways and parking lots to lawns and trees; garden view, which includes the lawn, trees and (in some rooms) the waterway around the resort, and pool view, which includes the Hard Rock's expansive pool. A step up from standard rooms are deluxe rooms. Deluxe rooms with king beds are around 500 square feet and can accommodate up with 3 people with an optional roll-away bed rental. These rooms feature a U-shaped sitting area in place of the second bed, and the rest of the amenities are the same as in standard rooms. Deluxe queen rooms are also 500 square feet and can hold up to 5 people using a pullout sofa, located in a small cubby just off the room's entrance. The Hard Rock's pool is an attraction all by itself and is the place to see and be seen. Situated in the middle of the resort's C-shaped main building, the 12,000-square foot pool includes a 250-foot water slide, sand beach, and underwater speakers so you can hear the music while you swim. Adjacent to the pool are a fountain play area for small children, sand volleyball court, hot tubs and a poolside bar. 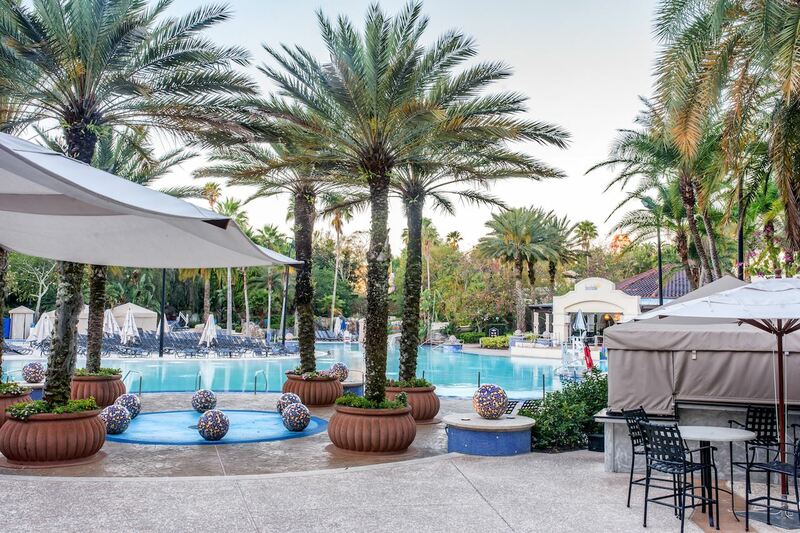 The entire pool area is lined with tall palm trees, but if they don't provide enough shade (or you just want to make an impression), private cabanas are available for rent. The Hard Rock also has a small, functional fitness center. Universal's nearby Portofino Bay hotel has a full-service Mandara spa. A supervised activity center, Camp Lil Rock, serves kids 4 from 5 pm until 11:30 pm (Sunday through Thursday) or midnight (Friday and Saturday). Cost is $15 per hour per child, plus $15 per meal. Call (407) 503-2200 for reservations. 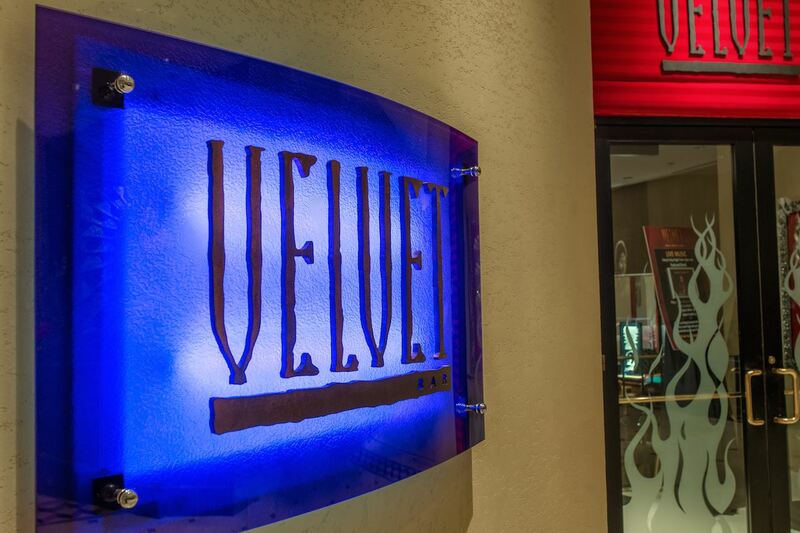 On-site dining includes The Kitchen, a full-service, casual restaurant open for breakfast, lunch and dinner, and featuring American food such as burgers, steaks and salads. Brave and/or crazy souls can take part in theKitchen Sink Challenge, which consists of eating The Kitchen burger, a side of fries, a fried pickle, and the humongous Kitchen Sink cake within a 30 minute time limit. The Kitchen hosts character dinners every Saturday, along with strolling magicians on Fridays, “Kids Can Cook” activities on Tuesday through Thursdays, and random celebrity chef sightings. 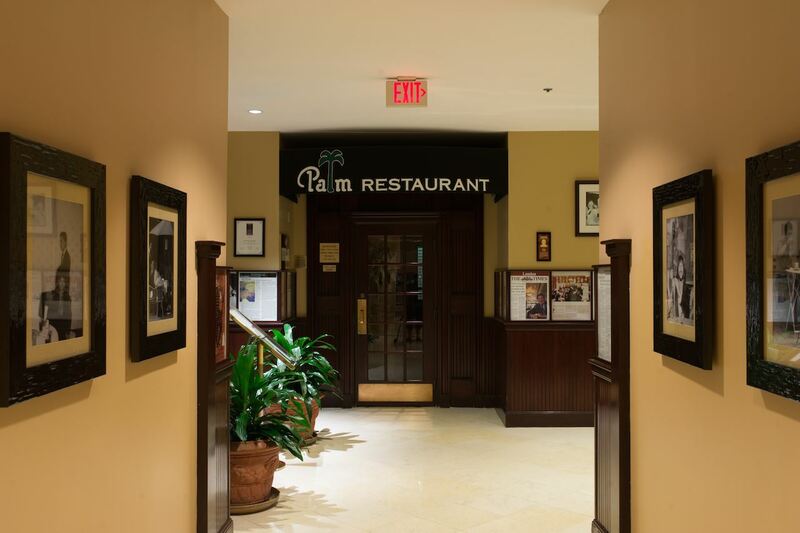 The Palm Restaurant is an upscale steakhouse available for dinner only. There is also an Emack & Bolio's ice cream shop and grab-and-go marketplace on the lower level; the stylish Velvet Bar in the lobby for drinks after dark and monthly Velvet Sessions rock & roll cocktail parties (visit www.velvetsessions.com for the schedule and to request an invitation); and the BeachClub bar and grill by the pool. And, of course, there's a Hard Rock Cafe restaurant just a short distance away at CityWalk. 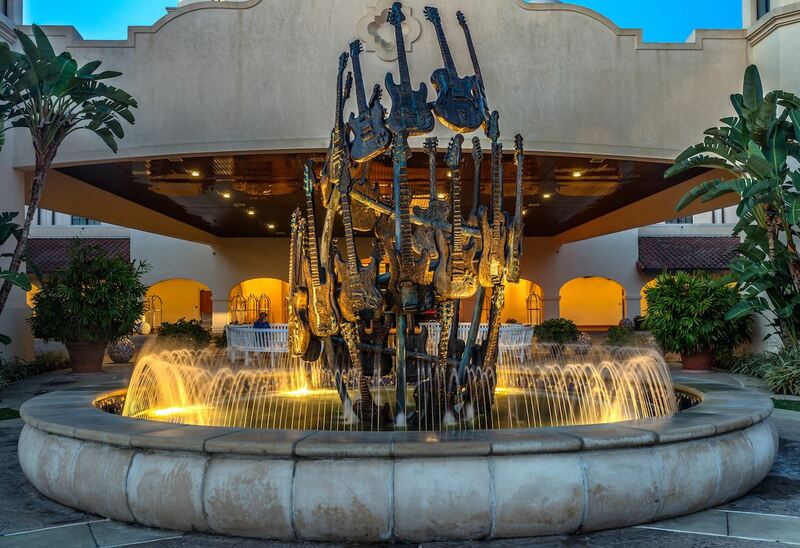 If all that musical immersion puts you in the mood to jam, you can borrow one of 20 Fender guitars – including Stratocasters, Telecasters, and even bass guitars – with amp and headphones for free (after a $1000 credit card deposit) through Hard Rock's “The Sound of Your Stay” program; ask the front desk for details. Rack rates run from a low of around $250 per night up to about $560 per night, excluding tax, depending on the time of year. After a much-needed 2015 refurbishment, we rate the rooms at Hard Rock slightly ahead of the more-expensive Portofino Bay. While not exactly cheap, Hard Rock is a good value compared to, say Disney's Yacht & Beach Clubs. What you’re paying for at the Hard Rock is a short walk to the theme parks and unlimited Universal Express first, and the room second. One word "WOW!" My group loved it! We splurged for a club room. My teenagers liked the club lounge... allowing them to pop in for food whenever they wanted. The beds were super comfortable, soft instead of firm mattresses. The pool was a big hit with the girls. 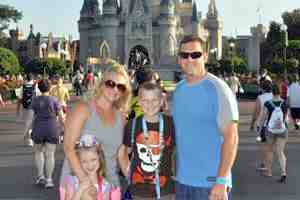 We all liked the convenience of being so close to walk to the parks. Rated 4.0 out of 5.0 based on 140 reader ratings.